Set in the middle of the Pacific Ocean, life in Hawaii was isolated for many millions of years prior to the arrival of the first Polynesian settlers. Over these millions of years, life arrived in Hawaii with the help of the wind, ocean waves, and birds with wings. As plants and animals came to the Hawaiian Islands, they found a paradise free from predators. They also discovered a wide array of climates in which they could settle. Over time, these arriving species underwent a process called “Adaptive Radiation.” This means that they evolved into new, distinct species and subspecies that are found nowhere else on Earth. In fact, the native plants and animals are so unique in Hawaii that over 90 percent of them are endemic, meaning they are found only in Hawaii. From the iconic Nēnē to the beautiful silversword plant, Haleakalā is home to a diverse and irreplaceable collection of native species. Of all the species of plants found within Haleakalā National Park, none has become more iconic than the beautiful Haleakalā Silversword. The only place on Earth that this endangered species can be found is between 7,000 and 10,023 feet of elevation on Haleakalā. 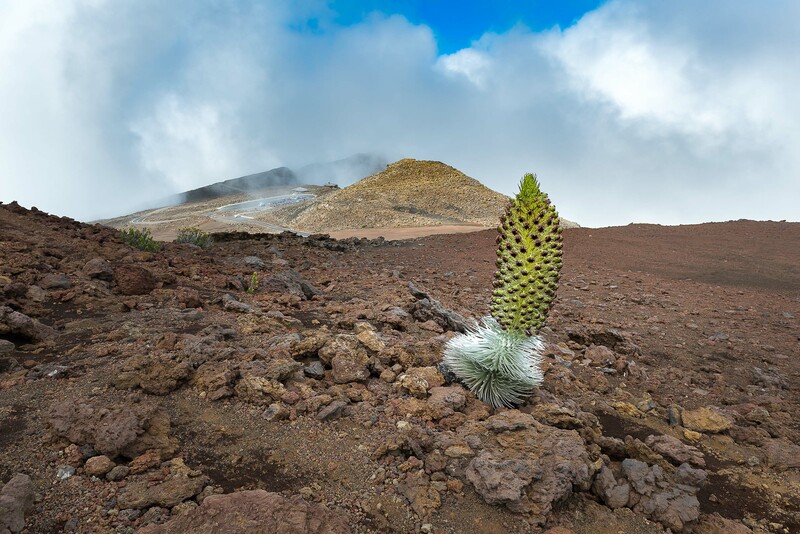 The Haleakalā Silversword is a low-growing plant with silver hairs on thick, stiff leaves. They survive very well in hot, dry climates such as the Haleakalā Crater. Silverswords are estimated to live between 15 and 50 years. The plant blooms only one time during its life and then it dies soon after. The flowering stalk of a silversword can grow up to nine feet tall and two feet wide. Its flowers are pink, purple or white and can be seen from mid-June to November. When the plant dies after blooming, the seeds are scattered by the wind as its flowers dry. The biggest threat to the silversword is tourists stepping on fragile root systems. Visitors to Haleakalā National Park are asked to protect this iconic plant by staying at least a few feet away from them to prevent accidentally damaging its roots. Hawaii’s State Bird, the Nene, can often be seen on Maui, especially within the summit area of Haleakalā National Park. Nēnē can also be found on Big Island and Kauai.This threatened species of bird has made a dramatic return in recent years after nearly going extinct just a few decades ago. The Nene Goose looks similar to the Canadian Goose that is commonly found in North America. In the early 2000s, scientists discovered that the Nene is actually a descendant of the Canadian Goose. It is believed that about 500,000 years ago, around the time that Big Island was emerging from the Pacific Ocean, a flock of Canadian Geese landed in Hawaii. These ancestors of the Nene stayed in the islands rather than migrating on as Canadian Geese usually do. Over thousands of years they adapted into a distinct species from their Canadian ancestors. The Nene was one of seven large ducks and geese native to Hawaii, but it was the only one that retained the ability to fly. The other large native geese and ducks in Hawaii gradually lost their ability to fly over many thousands of years, because Hawaii had no predators for these large birds before humans arrived on the islands. This meant that they could safely live on the ground without needing to fly. However, with the arrival of humans and the introduction of predators, the flightless birds on the islands quickly went extinct. This left the Nene as the last remaining native Hawaiian Goose species. The ability to fly helped the Nene as predators such as mongooses, cats, pigs, dogs, and rats came to the islands. 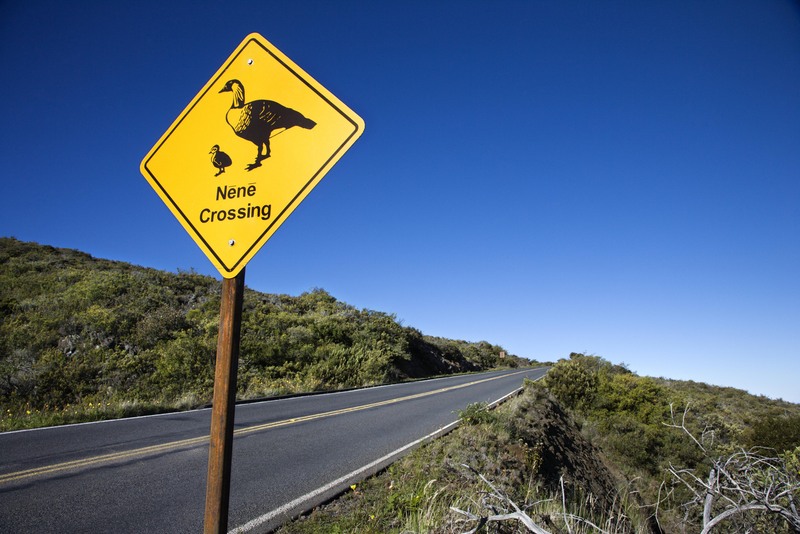 Yet even with the ability to fly, the Nene population plummeted and they eventually went extinct on Maui and all other islands across the Hawaiian Island chain. Only 30 Nene remained on Big Island by the 1950s. These last 30 Nene were brought into a captive breeding program and were saved from the brink of extinction. Nene were reintroduced to Maui by wildlife officials and a troop of Boy Scouts in 1962. Each Boy Scout strapped a cardboard box which held one Nene on his back and the troop hiked to Palikū. This is where the Nene were released into their new home as the first of their species to return to Maui since they became extinct on the island many years before. The ‘Ua’u is also known as the Hawaiian Petrel. It is an endangered Hawaiian seabird. The majority of Petrels nest on Maui so you are likely to see a Hawaiian Petrel within Haleakalā National Park. They also nest on Big Island in Hawaii Volcanoes National Park. The ‘Ua’u flies out to sea during the months of December and January, navigating the far reaches of the open ocean by the stars, much like the Polynesian Navigators who first set foot on the Hawaiian Islands. They return to land in February, nesting in burrows and between lava rocks, where they will lay eggs and raise their chicks. Haleakalā is home to the largest known nesting colony of the ‘Ua’u. There are between 450 and 650 breeding pairs nested between 8,000 and 10,000 feet of elevation on Haleakalā. During the day ‘Ua’u will fly out over deep water, looking for squid which is their preferred food. At night they will return to burrows on Haleakalā where they will feed their young. Because ‘Ua’u pay attention to the light of the moon and stars, they can be confused by headlights from cars, as well as other light sources. They are known to circle artificial lights until they become fatigued and then fall to the ground. ‘Ua’u are most often found grounded during the months of October and November when new chicks are learning to fly on their own, and just before the birds depart for the open ocean in December. Hawaii has been labeled the extinction capital of the world because the total population of so many species numbers only a few thousand or even a few hundred individuals. With such a small population, the introduction of a new threat or invasive plant can be enough to push the species from endangered to extinct in the blink of an eye. Yet for every threat, there is hope, like the recovery of the Nēnē from just 30 individual birds to the current population of over 2,000. There are many dedicated conservationists and concerned individuals who strive to protect these amazing Hawaiian species.